NextReports Engine has now support to export a report / chart to a table, a memory object with a header and data. 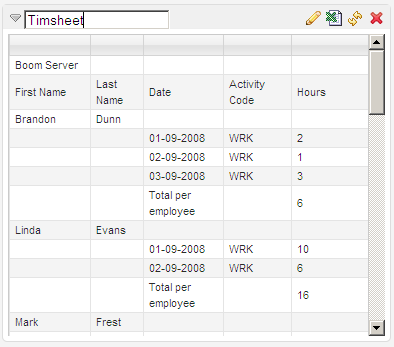 This exporter is used on the NextReports Server to add a table widget inside the dashboard. Widgets can be renamed through an editable label, near the collapse / expand button. Similar to charts, tables have settings (parmeters values), can be refreshed or deleted. From server version 2.1widgets can be saved as excel. For a table widget this is obvious. For a chart widget, the excel will contain X column and all Y columns defined inside the chart.